Researching more about the email and trying to find similar candidates, i went on several social media sites including LinkedIn, Twitter, and Facebook. 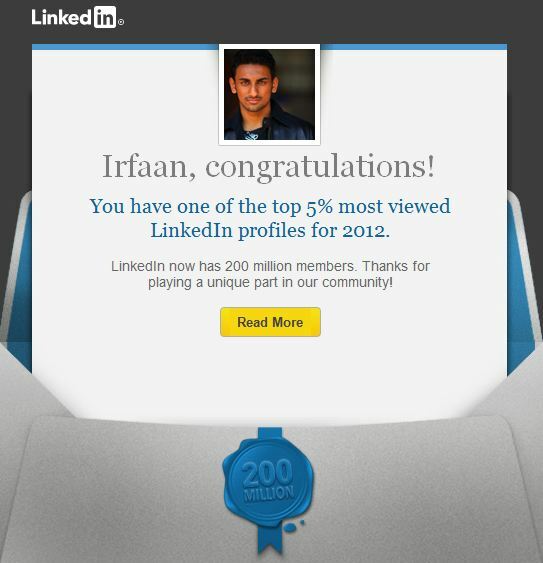 Surprise, Surprise – I wasn’t the only one with the ‘Honor’ of being the top viewed profiles of 2012. This one box was the masterpiece of this ingenious campaign. The strategy used by LinkedIn is brilliant to make the social network viral and reach more places than it did before. 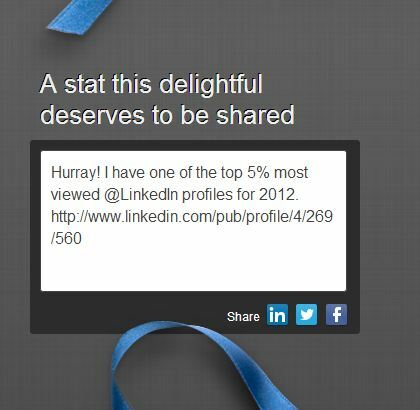 Sharing tool – LinkedIn goes Viral overnight! This Marketing Campaign will definitely invite others who don’t have a profile to get one and maybe turn Free Memberships to Premium Accounts! We will find out how successful the campaign is, if LinkedIn released the results of their memberships/accounts at a later date. Did you get a congratulations email too? What do you think is the real purpose of sending it?